March to the Cincinnati Zoo and save a waddle of cash! Experience cooler prices and even cooler animals during Penguin Days at Cincinnati Zoo (3400 Vine Street Cincinnati), with half-price Zoo admission every day and special animal encounters every Saturday and Sunday – now through Friday Mar 8. Every weekend, guests can watch penguins, polar bears and even elephants enjoy the winter weather in their own way during a variety of animal enrichment activities. Plus, enjoy heated indoor animal exhibits throughout the park. Penguin Parades return in 2019! It must be below 50 degrees for the penguins to walk. 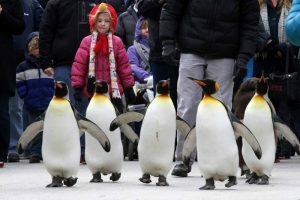 For more information, visit http://cincinnatizoo.org/events/penguin-days/.